Some people say snacking doesn’t have a place on keto, but I say it does. And, I think being prepared with a snack on the ready is often the difference between sticking with your keto lifestyle, and pounding back garbage foods that make you feel, well, like garbage. 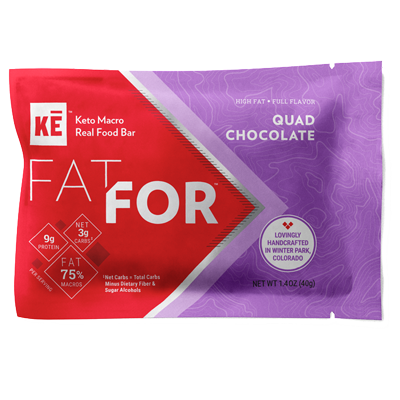 KE Macro Bars are whole food keto bars created with love by a solo lady keto entrepreneur. I first tried KE bars during sailing training where taking a break for lunch was not in the cards for the crew. First bite, and I was hooked! These are whole food bars. No fiber fillers, no sweeteners, no stevia, no sugar alcohols, just collagen, gelatin, cocoa butter, coconut, chocolate chips… for real food flavor. You can actually taste the ingredients! There are a couple flavor variations of the bar. My favorite is Quad Chocolate because it’s nut and seed free! Kevin’s favorite is Chocolate Chip.